Did you know pregnant? and ahead of you have happy months of expectation of the kid. But I want to know in advance when you can go to the deserved vacation. How to calculate the date of the decreeas well? First you itself or with the help of an obstetrician-gynecologist in the antenatal clinic should establish the period of pregnancy. The beginning of pregnancy is the first day of the last menstrual period. In determining the approximate date of delivery doctors believe pregnancy week from this number. Then the doctor will ask you to pass the examination in the gynecological chair and ultrasonography. Based on these results will be known more accurately, at what week of pregnancy you are now. From this we can calculate and the date of her leave. 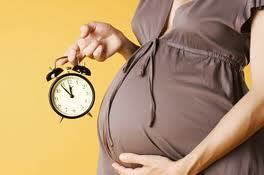 In our country it is women who have reached 30 weeks of pregnancy, and is 70 days before childbirth and 70 after. In case multiple pregnancy is given 84 calendar days prior to the appearance of the baby born and after 110. The period of postnatal maternity leave is extended by 14 days if a woman had a caesarean section or delivery was with complications. You can go on maternity leave before 30 weeks of pregnancy. But it can be done only if you have not used your usual, put for the year vacation. Or because of poor health. But then it will be the lack of sick leave, and paid it accordingly. If you are not very well carry the pregnancy, then tell the authorities about it. Perhaps they will go into your position and move you into a lighter place of service or reduce working hours. However, you most likely will lose in salary. But health and peace of mind of mother and baby is more important, isn't it? You have a good pregnancy and easy delivery!